Unit 1 P6 Describe how political, legal and social factors are impacting upon the business activities of Tescos and their stakeholders. 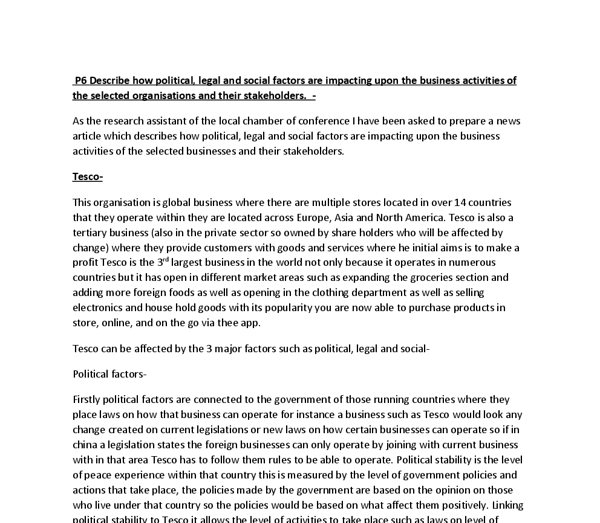 ﻿P6 Describe how political, legal and social factors are impacting upon the business activities of the selected organisations and their stakeholders. 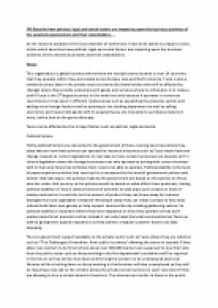 - As the research assistant of the local chamber of conference I have been asked to prepare a news article which describes how political, legal and social factors are impacting upon the business activities of the selected businesses and their stakeholders. Tesco- This organisation is global business where there are multiple stores located in over 14 countries that they operate within they are located across Europe, Asia and North America. Tesco is also a tertiary business (also in the private sector so owned by share holders who will be affected by change) where they provide customers with goods and services where he initial aims is to make a profit Tesco is the 3rd largest business in the world not only because it operates in numerous countries but it has open in different market areas such as expanding the groceries section and adding more foreign foods as well as opening in the clothing department as well as selling electronics and house hold goods with its popularity you are now able to purchase products in store, online, and on the go via thee app. ...read more. When the E.U was set up after the ww2 it was set up to easily transport resources such as coal between 2 or more countries where resources had been used up or have been destroyed in the original country so the countries who agreed to the treaty worked together to support each other. So far the E.U has allowed 3.5 million jobs that are linked between two or more countries for instance factories are set up in France to help run stores within the U.K, so the U.K being within E.U is relevant to Tesco because it allows easy access between countries to transport goods and set up resources and establishing a relationship with cheaper suppliers from other countries, so it is relevant to Tesco by allowing them to transport goods without being stopped or delayed between boarders. Legal factors- Company law is where they have a legislation which the formation governance of a firm is administered and controlled. Within the U.K the term company is used for business that fall under company?s act of 2006. It is the field of law which concerns companies such businesses, organization, partnerships and other business type?s that have an economic activity like charities. ...read more. Demographic indicators have changed in the U.K over the years, the most common change is the change in religion where those with no religion have increased, percentage of those Christian decreased, those Muslims have increased also those which other religion have also increased so to conclude there is more of multicultural society where the native religion is decreased. These changes do affect Tesco as an organisation where if they want to keep a large customer base or increase their customer base they need to show products that are relevant to those migrating in the country such as if there is a large population is eastern Europe they could advertise their traditional foods within the store to attract them so it they can successfully pull of a campaign they can attract new customers to the store. So at first it would be a challenge where they need to do market research and everything to see what nationality of people are moving in what products they are interested in such as the foods they prefer like fruit and vegetables, canned food and also what new foods they can offer. But then it does allow them to gain an opportunity if they do successfully attract a new customer base so profit would increase also would the reputation of the store would increase as well. ...read more. The introduction of this system did incur a large amount of capital investment to install but however is paying for itself in the long run. Sales forecasts are created on the computer using past sales figures. This greatly helps in the everyday running of Tesco Monaghan as the staff can estimate stock requirements and purchase it. non-electronic methods of communication which is used by the organisation to communicate business information clients/customers. Task 1 - Using examples identify the types of non-electronic methods which the organisation uses to communicate business information to different clients (p7). Task 2 - Identify the target audiences of the non-electronic communication (p7). Clearly as a result of conducting this test, Tesco were able to identify a market for this product and so must have made a commitment with the firm, thus purchasing more stock. This is one example of Test Market study which was successful for Tesco however you can imagine the implications for the store had the product not sold. When people feel less confident they are less likely to spend money which effects Tesco?s. Common effects of the ripple effect are people loosing confidence in spending money, often there are freezes in employment and potential job redundancies. However when we look at China?s economic environment it is very different.